Urban land is expensive where demand for floor space is high but supply is limited. When firms and households can't afford a rent inflated by high land costs, they move elsewhere, resulting in long, polluting commutes, new infrastructure costs and revenue and job loss for the city. Businesses that do stay - from law firms to grocery stores to daycares - pass the real estate costs on to their clients, increasing the cost of living for all of us. So does it really make sense to regulate development so strictly? It depends. 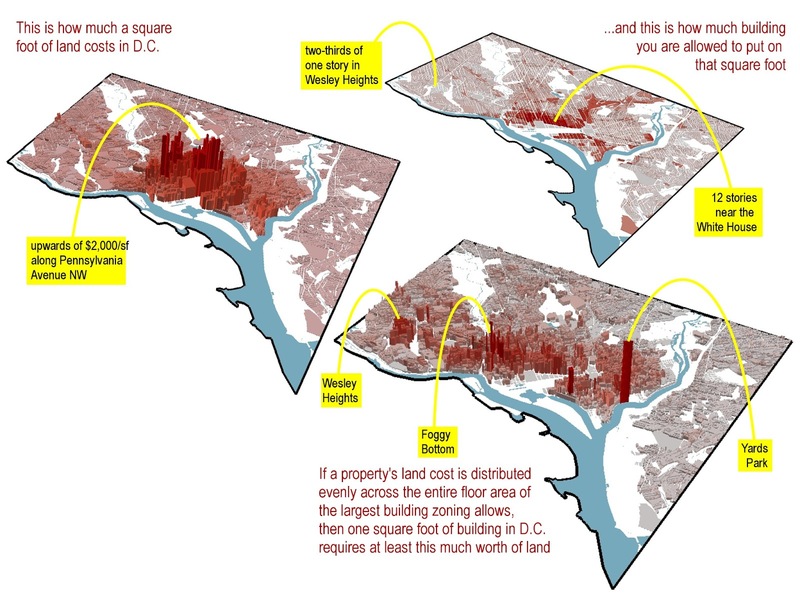 For example, the map closest to the bottom in the graphic above shows that there is tremendous pressure to upzone and develop Yards Park, but most would agree that the social value of an active waterfront public space outweighs the potential environmental and economic benefits that development could bring. Across town, the Wesley Heights overlay zone strictly regulates the bulk of the buildings within its boundaries for the sake of preserving the neighborhood character. Is it ethical for the city government to mandate, essentially, that no home be built on less than $637,500 worth of land in certain residential neighborhoods? The largest concentration of overly restrictive zoning (from an economic perspective) appears to be downtown, along Pennsylvania Ave and K Streets NW. If we value our designated open spaces, and won't concede the exclusivity of certain neighborhoods, but understand the environmental and economic benefits of compact development, then isn't downtown as good a place as any to accommodate the growth this city needs? Over the past week I have developed an unhealthy obsession with the concept of paying $36,000 annually for shelter, with no equity or tax deductions to show for it. 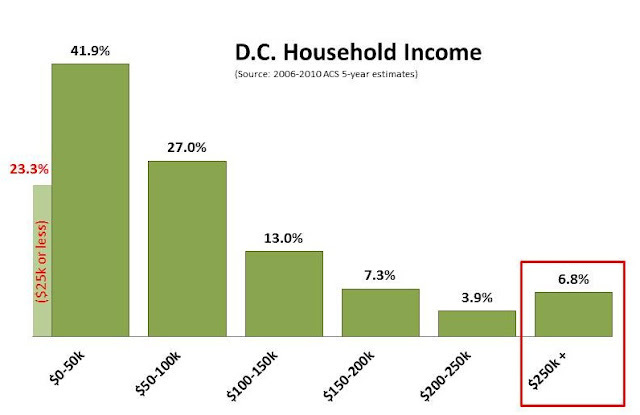 So here is one more tidbit on high rents in the District of Columbia. Between 2006 and 2010, 169 District households (remember that only a sample of households were surveyed) told the Census Bureau they pay an amount equal to at least $3,000, in 2010 dollars, in gross rent every month. 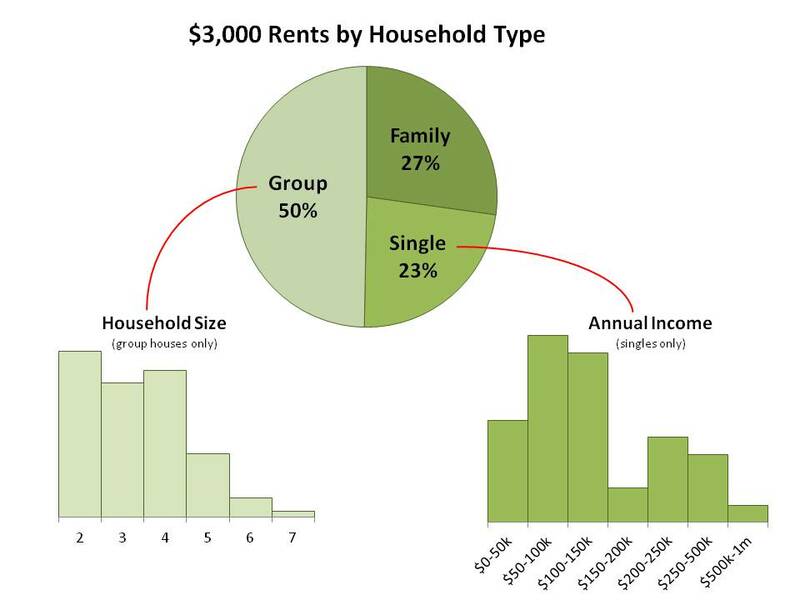 The demographic that these households represent likely captures a diverse range of people, from high-income loft dwelling bachelors like John Wall, to bands of 4-plus entry level nonprofit staffers united by Craigslist. Speaking in favor of limiting property tax increases for DC households, Jack Evans told the City Paper,"$250,000 in Washington, that's a lot of money, but it doesn't get you very far here." Compared to what? That amount might buy you less here than in Tulsa, but it absolutely goes further than an annual household budget of less than $250k, which is what approximate 93% of District households earn. Ten seconds of human interaction will reveal an enlightening secret: everyone thinks they are struggling. The more money you have, the more you spend. After mortgage and car payments, private school tuition, restaurant bills, travel expenses, and retirement savings contributions, even the rich feel stressed financially. But policy should be based on data and not anecdotes, and the data shows that nearly a quarter of District households earn no more than one-tenth of the amount Evans classifies as meager. Annie Lowrey's critique of Washington's economic success has the District chattering, in part because of how she characterizes Brookland. "Shabby" and "decidedly unhip" are too subjective to evaluate, but we can work with the claim that the neighborhood is mostly lower-middle-class. 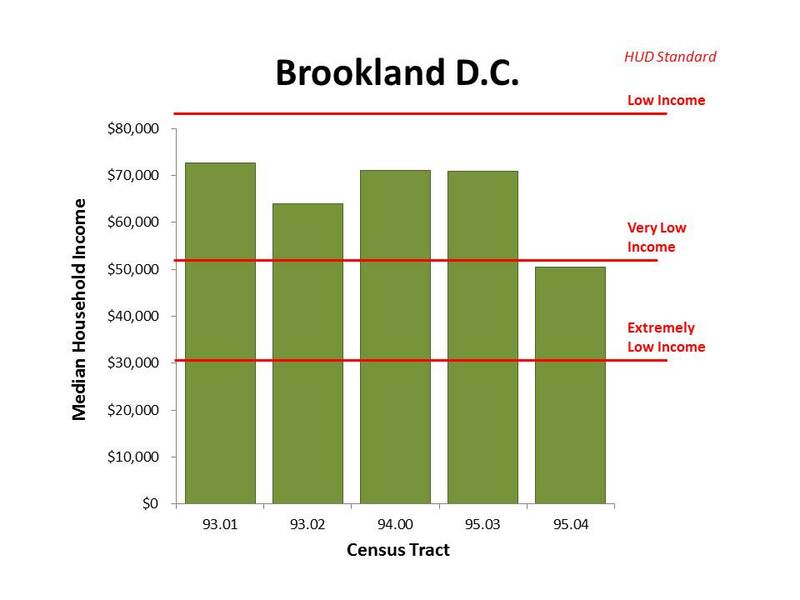 There are five census tracts that (arguably) are at least partially included in Brookland. The median household incomes of the tracts range from $50,500 to $72,587, according to the 2010 American Community Survey 5-year estimates. 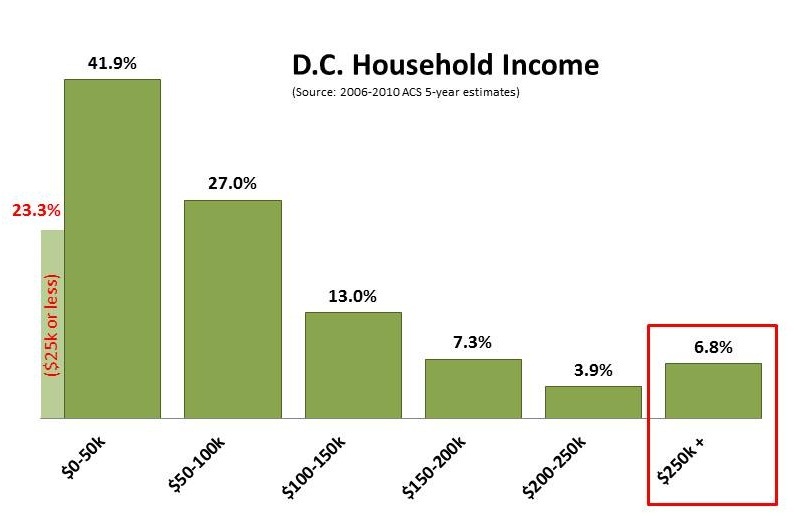 In 2010, the Area Median Income for the D.C. metro area was $103,500, and a household of four people earning between $51,750 and $82,800 was considered low income by the U.S. Department of Housing and Urban Development (HUD). Using this standard, it is probably safe to call Brookland predominantly low-middle-class. Whether HUD's standard is a good one is another question. How common is it to pay $3,000 in rent? Lowrey's article also suggests that Washington's yuppie newcomers are quick to shell out three grand for an amenity-rich crash pad. 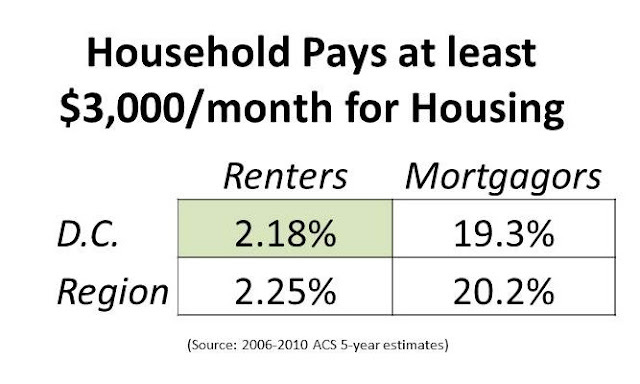 But data indicates that only 2.2% of District renters pay that amount or more. Since her article looks at the Washington region and not just D.C., let's include Fairfax, Arlington, Alexandria, Montgomery, and Prince George's Counties. The statistic only increases ever so slightly. While the $3,000 rent seems to be mostly a myth, Washington-area homeowners do pay outrageous sums towards their mortgages, with close to 20% of mortgage-paying residents of the District and the region (including only those counties listed above) spending at least this much. So let's say Lowrey is half right on this one. Update: Comments on Greater Greater Washington suggest that $2700-$2900 might be a more realistic high end rental rate for apartments. Perhaps Lowrey rounded up to $3000? That does not seem unreasonable. 5.07% of D.C. renters pay at least $2,500 in monthly rent. 4.84% of regional renters pay that much. Also, the ACS data used is adjusted to 2010 dollars. Survey responses from previous years are adjusted up to account for inflation, but not for steeper boom-induced increases.